Paige Ellis and Frank Ward are facing off in a runoff for Council Member Ellen Troxclair's seat. AUSTIN — For the past four years Austin City Council Member Ellen Troxclair has brought a different perspective to the dais. The council is a non-partisan body, but everyone knows who's blue and who's red. If you're new to city politics, here's the CliffsNotes version, Troxclair is the only Republican at the table. Her views often put her at odds with the rest of the council. Still, many argue that in order to have a healthy government, you need dissenting voices. And the voice of a Republican is something the Austin City Council could soon lack. Troxclair decided not to run for re-election. 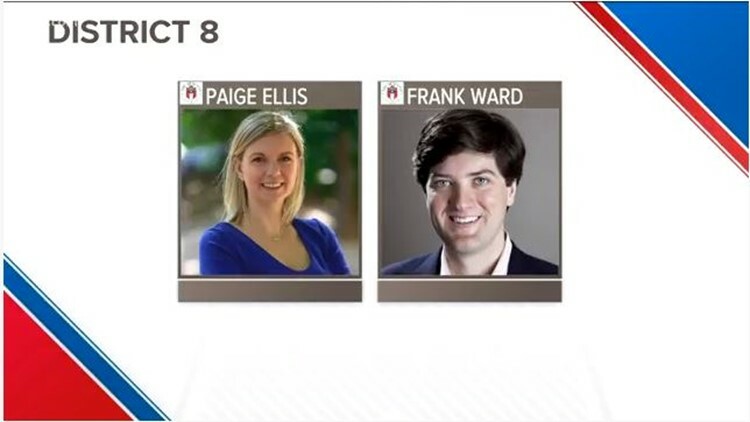 Paige Ellis and Frank Ward are going head to head in a runoff to replace her. Ellis is a marketing and public involvement specialist for an environmental consulting firm bringing experience she believes the people of District 8 want. "We are largely covered by watershed protection areas and we have a number of creeks that are really sensitive. And I think someone with an environmental background should be the person making the decisions about those particular natural resources," said Ellis. Ward is a husband, father and public affairs executive. He serves on the City's Park and Recreation Commission and has experience working on the city, state and federal level. "I'm very, very determined to get our taxes down, to fix traffic, to address the kind of bureaucratic red tape that's costing businesses and families and driving them out of the city," said Ward. Ward is the only Republican who ran for the seat and Troxclair is endorsing him. For the District 8 residents who make Austin the blueberry in the tomato soup, Ward said if elected, he will fight for them too. "It was a point of pride to me during the general election that where you would find my signs in the yards of Ted Cruz supporters and Beto supporters," Ward said. "I'm somebody who doesn't want to play party politics. What I want to do is fix problems," he added. Ellis has the support of Mayor Steve Adler. And to the conservatives in District 8, Ellis says yes, she's a Democrat, but that doesn't mean everyone thinks alike. "The truth is that even if we have 11 progressive council members, they are not all going to agree on everything. We all have different approaches to what's important to our district, and different methods for moving things forward," Ellis said. KVUE News sent questionnaires to the candidates. Click here to read their responses. KVUE also sat down with both Ellis and Ward during Midday. You can watch both of those interviews below.